A rising rock band are hoping to drum up support for the world’s last flying Avro Vulcan V bomber, “The Spirit of Great Britain.” Metal outfit Knock Out Kaine have pledged all the proceeds from their upcoming single to the campaign to keep XH558 — based at Robin Hood Airport in Doncaster, England — in the skies. The Midlands-based four-piece are all huge fans of the iconic aircraft and are set to film their debut video for the song “Set The Night On Fire” inside the plane’s hangar. 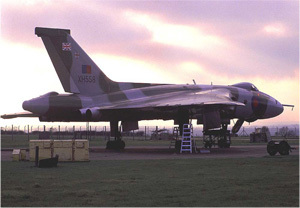 And lead singer Dean Foxx said the idea to donate cash to the Vulcan To The Sky Trust, the organisation which raises vital funds for the plane, comes from Vulcan memories in childhood including the bomber’s deployment during the 1982 Falklands War. For the complete story in The (Sheffield, England) Star, click here.